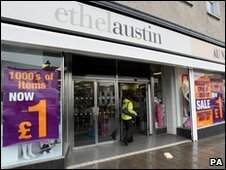 Clothing retailer Ethel Austin has gone into administration for the second time in two years. The group's 276 stores will continue trading as normal while a new buyer is sought, administrators MCR said. But MCR said it could not rule out closures or redundancies as there were "no guarantees" that a buyer could be found in the current economic climate. Administrators blamed the move on failure to secure funding, compounded by poor trading in January. Ethel Austin's sister company, homeware retailer Au Naturale, has also gone into administration. Together, the two companies have 276 stores and employ more than 3,700 people. In the past year, Ethel Austin has taken over 12 empty shops formerly occupied by Woolworths - the biggest retail casualty of the recession. "There is no doubt in our mind that the onset of the global economic crisis has hit the retail sector particularly hard," said Geoff Bouchier from MCR. "As a consequence of this the companies have struggled to secure funders which in turn has impacted their ability to generate sales revenue." Unusually, MCR said customers would still be able to redeem gift vouchers purchased before 8 February, but only to pay for up to half of any transaction. Usually when a company goes into administration, those with gift cards are deemed to be unsecured creditors and have to try and claim their money back from the administrators. Customers will still be able to exchange unwanted goods bought within the last 28 days, but no refunds will be given, MCR said. Those who have bought goods but not yet received them will need to put in a claim as an unsecured creditor. Those who paid by credit or visa debit cards may be able to get their money back from their card issuer. The Union of Shop, Distributive and Allied Workers (Usdaw) said it was already working with the administrators to secure staff employment. "Today's announcement is terrible news for the loyal and hard-working staff who now face a period of uncertainty surrounding their future," said John Gorle, Usdaw national officer. Despite the fact the recession is now over in the UK, analysts say the outlook for the retail sector remains bleak. "2010 will be tough. The only consensus is that no-one knows what will happen," said Mark Hudson at PricewaterhouseCoopers. "However, most think it will not be pretty, with risk on the downside. Retailers we've spoken to have all said the same - performance will be slow but steady until summer, then all bets are off until the first budget post the election." Ethel Austin started more than 75 years ago in Liverpool. Its head office is in Knowsley, Merseyside, where it employs 401 staff. The company first went into administration in 2008, but was bought within a month by the former head of retailer MK One.